The juror has completed the review of the submitted works and has made his selections. Daniel Fulco, Curator at the Washington Museum of Fine Art in Hagerstown, Maryland reviewed 150 works by 61 artists from 15 states and selected 32 works for the exhibit, which opens on April 4. The exhibit will be on display through May 5 at the Berkeley Art Works, 116 North Queen Street in Martinsburg. There will be a reception in the gallery on Friday, April 6 from 5-7pm. Gallery hours are Wed-Fri 11-5, Sat 11-4. It has been an honor to serve as the juror for the 8th Annual Art & Earth Juried Exhibition organized by the Berkeley Arts Council. This show assembles works completed by artists in a wide range of media including oil, acrylic watercolor, photography, ceramic, metal, fabric, and wood. 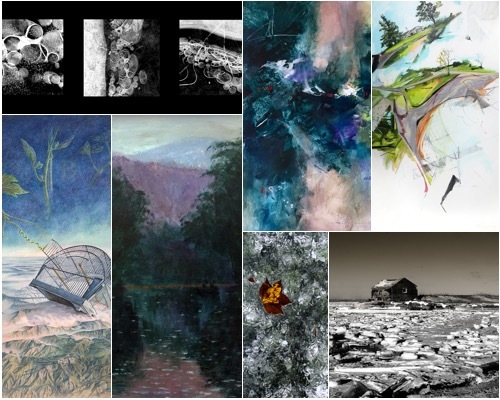 150 submissions were received from 61 artists across the nation. The variety of this year’s entries made the selection process especially challenging and it was indeed difficult to narrow down the choices for inclusion. It was a pleasure to observe the depth, breadth, and outstanding quality of execution of the work from all participants. With its central theme focusing on the natural environment, this exhibition afforded artists the opportunity to respond to the landscape and its various features in diverse ways. While some artists chose to depict specific scenes of rivers, mountains, valleys, and other natural formations, others elected to represent their impressions or recollections of these sites abstractly. Despite key differences in style, approach, and technique, each of the works is bound together by their creators’ special sensitivity to revealing the beautiful subtleties found in nature that tend to remain hidden or unnoticed. These qualities include seasonal transformations, patterns and textures found in waterways, leaves, trees, and other natural objects, and dramatic changes in atmosphere and light. I applaud all of the artists for their dedication to making art and thank them for their willingness to submit their work to this exhibition. It is wonderful to observe such remarkable talent in both in our region and beyond.